The History of the Fox Wars including details of the cause, reason, and summary. The dates and years of the Indian wars - when the war started and when the conflict ended. Fox Wars Summary and Definition: The Fox Wars were a series of conflicts from 1701 and 1742 between the French and the Fox (Mesquakie) Native Indian tribe and their respective allies in the regions that are now the states of Michigan and Wisconsin. The names given to the major conflicts were the First Fox War (1712–1716) and the Second Fox War (1728–1733). 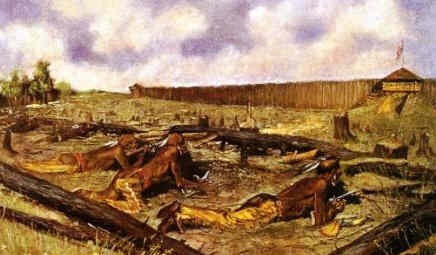 The first war began when Fox, Kickapoo, and Mascouten attacked Fort Pontchartrain, later called Fort Detroit. The Second War flared from 1728–1733. The Fox Wars were caused largely economic reasons related to trade. The tribe controlled the Fox River and exacted a toll from all those that accessed it. The French wanted rights to use the river system to gain access to the Mississippi which was vital for the fur trade between French Canada and North America, especially the Sioux. The French set up a trading post called Fort Detroit and invited many Indian tribes to settle in the area. Conflicts soon arose. 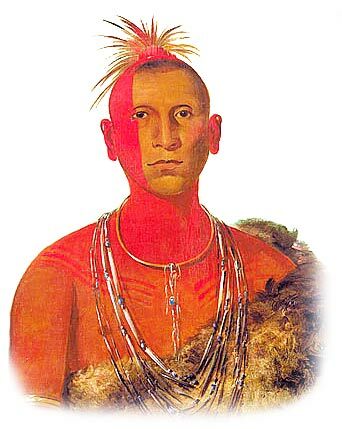 The Fox were the only Algonquian speaking tribes who did not support the French. The animosity between the two was due to the French encroachment on Fox lands for trading purposes and the close relationship that the French had with the Chippewa (Objibwe) tribe who were the mortal enemies of the warlike Fox. Following the defeat in the wars the Fox Native Americans were reduced to 500 by French troops and their Native Indian allies. The tribe continued with their resistance by allying with the Sauk in 1735 to fend off the Europeans and other Indian tribes. The Fox (Meskwaki) resistance to French rule was so effective that the King of France signed a decree commanding the complete extermination (genocide) of the Meskwaki which was the only edict of its kind in history. Colonialism: In the 1700's the Europeans brought with them the system of colonialism, primarily to generate income, which encompassed "the policy and practice of a power in extending control over weaker peoples or areas." This short History Timeline of the Fox Wars provides fast facts and information about the history, years & dates, key events and famous people who fought in the Fox Wars. 1712 The French, under the command of Charles Renaut Sieur Dubuisson, were concerned at the close proximity of the Fox village to the fort, having less than 50 French troops in attendance and two of their closest allies, the Huron and Ottawa, were on hunting trips. 1712 April 1712: Siege of Fort Detroit: The Fox with Sauk and Mascouten warriors totalling nearly 1000 men laid siege to the garrison of Fort Detroit (see the above picture). 1712 May 1712: When the absent tribes returned, the Fox were then caught between the French and their Allies and were themselves besieged until the end of May. The Fox were forced to surrender so their families would be spared. The French agreed, but after the Fox were disarmed, they and their allies attacked and killed over 500 in what became known as the Fox Indian Massacre. 1716 First Battle at Little Butte des Morts: French commander Louis de la Porte de Louvigny led an expedition of 800 to confront the Fox at their fortified village located at Little Butte des Morts. The battle raged for 3 days but the French were the victors. 1724 - 1728 Various French expeditions to northern Illinois and Wisconsin were led by Constant Le Marchand de Lignery who negotiated various truces, which were largely ineffective. 1737 The French grant a general pardon to the Fox (Meskwaki) thus ending the Fox Wars. 1742 The remaining Meskwaki prisoners were finally released by the French. The effects and significance of the Fox Wars in history is that the Meskwaki suffered removal from their ancestral lands and the number of people of the Fox nation significantly and sadly diminished from over 6500 at the start of the wars to less than 500 at the end of the wars. 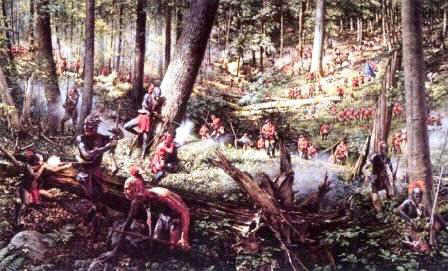 The demise of the Fox led to the prosperity of the French fur traders and the power of the French in the area until they were ousted by the British following the French and Indian Wars. Fox Wars. Discover the key years, famous people and events of the Fox Wars together with the causes and effects of the war, conflict and battle. Pictures have been include wherever possible which show the battlefield, clothing and weapons of the Native Indian tribes and their leaders who fought in the Fox Wars. The illustrated text provides a really useful educational resource for kids and children of all ages. We have included pictures and videos to accompany the main topic of this section - The Fox Wars. The videos enable fast access to the images, paintings and pictures together with the information and the many facts featured on this subject of the Fox Wars.